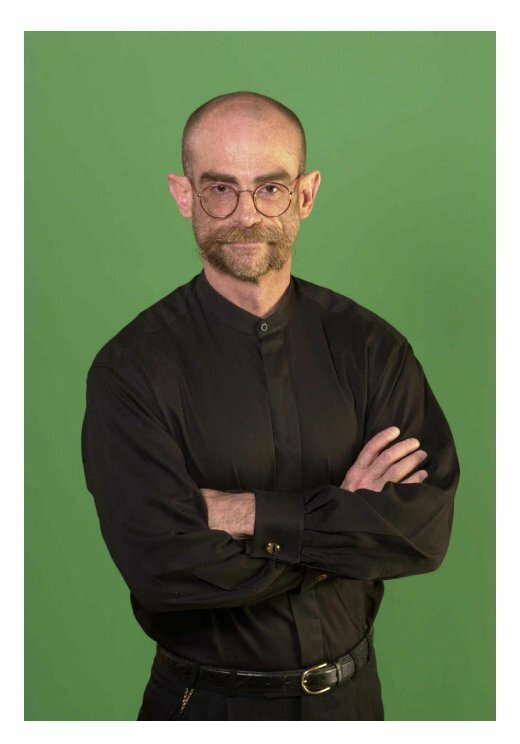 David Schrader Interview with Bruce Duffie . . . . . . It is not often that I am able to stay in touch with one of my interview guests, but being a Chicago artist, David Schrader is one that I continue to see in concert regularly, and have run into on the street both downtown and near where we live. One of the special things to do on New Year’s Day is his open house, where many of us who are in town gather to commiserate about the old and ring in the new. A major figure in the early-music scene and with a significant number of recordings to his credit, we decided in 1992 to have a chat and let the tape recorder eavesdrop on the conversation. Always witty and sometimes even a bit sarcastic, we both laughed often and nudged each other when familiar topics arose. As we were setting up for the interview, we discussed the ins and outs of the recording business, and the pros and cons of the LP vs. the CD. Remember, the compact disc was still somewhat new. By the time they came onto the market, most of us who enjoyed long playing records had discovered or developed techniques for playing them and preserving the clean sound as best we could. One such method was to take brand new records and play them once while taping them. Then, any further listening was to the tape — which was less apt to have pops and clicks from grit and scratches. This is where we pick up the conversation . . . . . .
David Schrader: A friend of mine did that. He finally took the quantum leap several years ago, and taped all his LP’s, got rid of them and gave me his turntable. When an LP is in good shape, it sounds as good as a CD; it just takes more maintenance. People don’t understand that you can do that if you want, but it’s going to cost you a lot of money for the turntable. Bruce Duffie: Some people say the sound on the compact disc is a little drier. Do you find this? DS: I’ve never found that to be the case, but I’d preface this by saying that I’m not really a practiced audiophile. I like music and I listen to all different kinds of it, but I must say I’m not really schooled in what serious systems are like and what they’re meant to do. To me, the salient thing in CD sound is just the cleanliness; sometimes a vibrancy is very nice. I think maybe even some recording artists have gone for different patinas before. The Harnoncourt recordings of the major Bach works in particular give you the aural impression of a varnished painting. They’re extremely beautiful, but you’re seeing them through a kind of a candle-lit glow, and there was a particular quality that maybe LPs could bring out better in this. I haven’t heard those works re-released on CD yet, so I don’t know. BD: You listen to concerts all the time, either as performer or as just spectator. Do you find that the sound on the CD is the same as what you’re getting in the concert hall? DS: Oh, yes! I think, in fact, that’s one reason that recordings are wonderful — they sell. They introduce people to a wide variety of musical repertoire, but at the same time I don’t think they’re really a substitute for a live performance. That’s why people still go to concerts. BD: So people will always go to concerts? BD: [With a slight nudge] You mean you wouldn’t want to be just a recording personality, like Glenn Gould? DS: Only if I could swing it financially. He’d had such an interesting career up to that point that it continued that way. It almost became a personality cult at the end. He was certainly a really interesting artist. BD: Are you pleased with the recordings that you have made, especially the new series on CD? DS: Yes. As always, you have worries. Sometimes you come away from sessions tired, thinking that this or that could have gone better. I’ve just heard the rough edit of the C Minor Fugue on the Theme of Legrenzi for the next Bach organ record. The builder had done a little bit of re-voicing on the great big pedal reed that some critics complained about. I think that it’s a little bit more like what it should be. It was good before and I think it is just as good now, but it would seem that from the edit — even on a not-so-hot cassette that I was sent — that it’s going to make the instrument sound beautiful. BD: Do you find the transition from harpsichord to organ an easy one? DS: It would depend on the order in which I had to play them. Like singing, it’s easier to go from a light voice to a heavy voice in the course of an evening, such as the three acts of Traviata. You have to be a coloratura in the first act, a lyric in the second and finally a dramatic in the third. It’s probably easier to progress to the heavier actions, so I’d never object if I play harpsichord first and then organ second. On the other hand, if the instrument is small — that is to say a small organ — it’s not so bad because the action will be proportionately lighter. Then you don’t have to worry. BD: Are there some organs that you really have to fight in order to get the sound you want? DS: Oh, sure! There are some organs, either by nature of their size or their construction, that will have mechanical actions that are very, very heavy. In the case of a very large mechanical action instrument, as Hans Steketee, who was the head of Flentrop once said, “The action can’t be like a harpsichord if the instrument is this big.” I think, to an extent, he’s right. There’s a gravity inherent in the sound quality of a very large organ. You want to be careful — by your tempo and by the very way the instrument feels — to play so that you know you’re governing it the right way. You send these messages, as it were, from this most public of instruments down to the audience. So the action of the instrument, if it’s really well-built, will in some ways determine the character; or may not determine it, rather, but reflect it. BD: How long does it take you to get it so that it is reflecting what you want, rather than what it wants? DS: That’ll vary from instrument to instrument. In the case of a shop-built instrument, each builder will be different, and there would be many good or easy ways to do that. There are some difficult ways, too, so it would really depend on how comfortable you get with the action immediately. I’ll give you a good example. 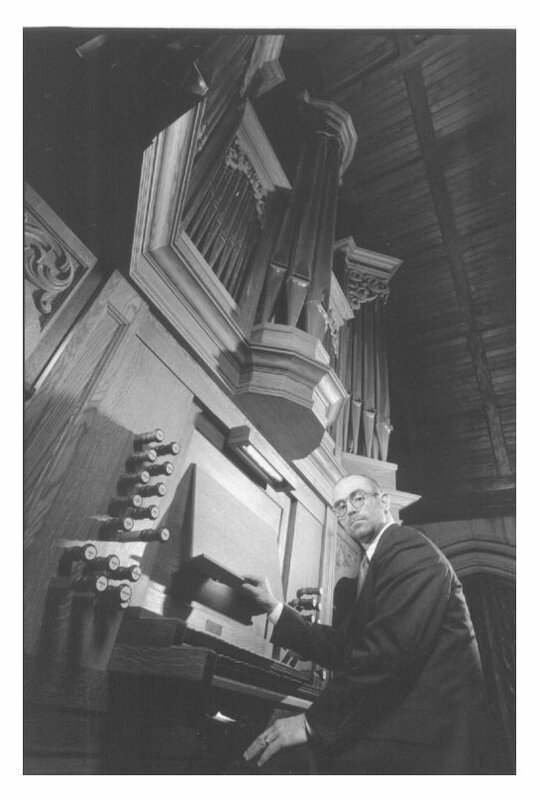 When I played the Fisk organ at Wellesley College, which is a beautiful mean-tone instrument that was put in in 1981, that action I found to be very friendly. Both technically and interpretively, it had an immediacy and yet a certain cushion in the feel that made you very confident in being able to do what you want. You can also squire yourself around the subsemitones; it has separate keys for D# and E♭, and G# and A♭; the most commonly used accidentals in mean-tone temperament are E♭ and G#. You’ve only got three-quarters of an inch of space for your finger to hit those keys. The less-used one is smaller, but if you hit it, I’ll tell you, you really know you’ve hit a goober. [Both laugh] Now on the other hand, an equally beautiful action for the type of instrument that it is, is the Oberlin mean-tone instrument, which is an instrument built about the same time by the Oregon builder, John Brombaugh. There you’ve only got one half-inch of space to stay on the right subsemitones; and there’s one more! He also gives you B♭ and A#, so this can be more confusing to the player. Let’s just say it behooves one to spend a little more time on that instrument than on the other. BD: I would think that it would be really confusing to go from one instrument without these extras to the instrument that does have the extra keys, and then another instrument that has more extra keys. DS: It would be weird. Fortunately, of course, you don’t usually have to do the radical change of subsemitones — which is what you call the extra keys. Within the same concert, it would be very rare that you’d have two organs equipped with subsemitones. On the other hand, the wildest example of subsemitone usage was the Archicembalo in the early seventeenth century. It was a harpsichord where the octave was divided up to thirty-two equal parts. You had step keys to get to all of this, and evidently Luzzasco Luzzaski and some other people were said to have learned how to play it. How fast, we don’t know, but it was impressive. DS: It’s interesting. I have a cousin; he’s not working in microtones so much, but he’s just invented a new prototype of a keyboard that works outside of a conventional octave. He claims it’s easier to work with; he’s working on publicizing it and trying to make it fly right now. But watching him work with it impressed me that you could develop facility on it. So it’s hard to say. BD: Coming back to the mean-tone organ, is it difficult to find the audience receptive to something that’s going to sound a little bit different than an ordinary piano or an ordinary orchestra? BD: [Sarcastically] Remember The Lost Chord? Well, I found it! BD: Seriously, can we say that some of these sixteenth century guys were the first minimalists? DS: I don’t think they thought of it in the same way. They didn’t have the conventions to rely on. Minimalism is, in effect, a kind of superimposition and a flouting of convention at the same time, whereas the older study of music involved music much as an extension of mathematics and theology. Parodies were relatively rare, and you certainly wouldn’t have found them much in organ music. There are some, though. There is one parodistic piece by Hans Kotter. It’s a dance that is written all in parallel fifths, and it’s meant to ridicule earlier fifteenth century music. It’s a wonderful piece to hear, but he’s just thumbing his nose. The other night, I just listened to a remarkable piece by William Byrd, the anthem Oh Lord, Make Thy Servant Elizabeth. The interesting thing is when you hear that piece, you can tell that he is not parodying but actually employing an older style, because the piece was written for a state occasion. You have a feeling that he was trying to equate her, at least artistically, with the Catholic Tudors, and therefore establish the legitimacy of her end of the throne. On this particular compact disc, you have the opportunity to compare it with pieces more typically Byrd. But then suddenly you get into this anthem, and in about the middle of it you realize that he’s employing the language of Taverner in the beautiful, undulating harmonies, and the very pungent, resonant dissonances that Tallis uses all the time — lots of lowered sevenths and so forth. The language is more florid, too with the disconnected ‘amen’ that reflects earlier, pre-Reformation English church music. So maybe that’s a parody or maybe that was a conscious attempt to dignify Elizabeth’s Queenship by the use of a different style. Who knows? BD: Was this musical caricaturing? DS: To a point. This is music used in the time-honored way of using it for politics, but probably with a more savory aspect, say, than we’d think of some twentieth century Soviet music. This wasn’t employed in a servile way to the state, but just as a way of adorning an occasion, like the motets of Mouton and others like that. But you get into a piece like The Iron Foundry by Mosolov, and you realize that this piece is written to reflect an industrial state. There’s a clever and ingenious effort given to the music, but it’s definitely subservient to what’s going on! Have you ever heard that piece? BD: No, I don’t know it. BD: That one I know. I’m sure it all worked as a program. BD: I’m thinking of doing some programming in October for the seventy-fifth anniversary of the Revolution. It needs to be political, ‘vita brevis, ars longa,’ or something like that! DS: Sure. Oh, of course! BD: I will play music written for the politics of the time to say the political life is dead, the system is dead, but we can still play the music once in a while just to know what it was. DS: Sure. I think that’s right. In some cases the music is enduringly beautiful, just in the same way that very decadent political systems can produce music and art that’s exquisite. Personal opinions about royalism aside, the Ancien Régime in eighteenth century France produced exquisite music. The very late Byzantine Empire, when Constantinople was just a city and really no empire anymore, still produced incredibly beautiful artwork. It doesn’t always have anything to do with the political stability. BD: We’re talking all around this, so let me ask one of my favorite questions. What is the purpose of music? DS: That’s a good question! [Both laugh] I don’t know. I can say that it seems to fulfill an artistic need that painting and sculpture and architecture and theater don’t tend to do by themselves. What it is, is hard to explain. A friend of mine who is a wonderful piano technician and composer says, “Do you realize that we spend our entire lives either regulating how, or doing it ourselves, the act of people wiggling the air?” Our profession depends on how we wiggle the air. [Both laugh] Now what effect does that have on the listeners? It sort of has everything. It has excitement, tenderness, bravado, pathos, all the different things you could go through. So what is the purpose of music? I’m not sure. BD: “Wiggling the air” is like saying the painter tints the canvas. DS: Sure. It’s a reductio ad absurdum. Heinrich Schenker in his reductio ad absurdum analysis of the Beethoven Fifth Symphony reduced it just to C-G-C.
BD: [Laughs] If you listen when a tape is spooling, because of the increased speed the bass line is quick and clear, and you can hear the form and analysis of it going right by! DS: Oh, absolutely! And different ages thought the purpose of music was different. As I mentioned before, the Middle Ages and the Renaissance considered it an extension of mathematics and theology. The harmony of the earth should reflect the harmony of the spheres according to ratios and proportions. When you read the necrology of Johann Sebastian Bach, his day and age was referred to as practicing thorough bass for his spiritual edification. In other words, if you had a grasp of figured bass, you had a grasp of the harmony of the spheres. BD: Getting a leg-up on the Kingdom of Heaven? DS: Well, sure. In fact, there were no music books in Bach’s library; there were just theological volumes. In those days, you learned your art like an apprentice, and Johann Sebastian Bach would simply have learned by singing in choirs, picking up instruments and learning how to play in ensembles. BD: Are we spending too much time with the nitty-gritty and the details of music, and missing the forest for the trees? DS: Probably, but that’s just the nature of us as professionals and people who are aficionados. It’s maybe the true casual listener that gets this better than any of us! I had a friend that used to do sedentary kind of work that didn’t require a lot of interpersonal communication with his co-workers, and he could put away two Verdi operas in a day. He’d listen to one in the morning and one in the afternoon, and I can tell you he knew the repertoire far better than I did from a certain standpoint. I would have to actually get in and learn the pieces I would perform. On the other hand, he could converse freely on pieces that would take time in addition to listen to. This is stuff you can pick up through experience, but I think sometimes the casual listener has a very big picture — if the casual listener borders on the aficionado. BD: With all of this talk about audiences, do you perform differently if you know that an audience is made up of one group or another? DS: I’m not altogether sure I would do that intentionally, though I think it’s inevitable that different kinds of audiences have different reactions on you. A seasoned performer will get a gut feeling after a while of what seems to be reaching the audience and what isn’t. Sometimes that can even happen in halls where the lighting is so bad it’s like facing an interrogation. I played a fortepiano recital a couple of years ago in a very pretty hall in Schaumburg, but the stage lights were reminiscent of being interrogated on a hardwood floor, and the audience consisted only of rounded heads; yet I had a feeling that that audience was very much with what I was trying to do that night. BD: They had a sense of vibration? DS: Absolutely, yes. I think you can sense a closeness, sometimes, in a big church playing an organ recital. You just know when you’ve got people and when you don’t, even in a venue like St. Mary the Virgin on 46th Street in New York, which is one of the finest marriages of room and instrument in the country. Even though there’s a fatal drop between you and the audience — you wouldn’t want to take a bow too deeply there — the feeling with your audience is magic because you have a sense of the majesty and the persuasiveness of the sound that you’re producing, whether it be just one stop or what I would call, frankly, truly a terrifying full organ sound. BD: You get that when you’re playing. Do you assume that the audience will get that just by walking into this room? DS: In the case of St. Mary the Virgin, yes, without question. It’s the kind of room where your jaw drops. First of all, you don’t expect to find it. You walk down 46th Street in New York, which between 6th and Broadway is very, very populated. It’s a dense neighborhood, and you only realize you’re at a church when you walk up right next to a Trumo statue of the Virgin. You look up, and there’s a gothic façade before you, so you go in and the rest is history. It’s a very high vaulted room, and it’s dark. If you’re ever to play some murder mystery in a church, this would be the church you’d do it in. It’s a spectacular looking room, but the acoustics really are remarkable! BD: Is it quiet enough from the outside noise? DS: Basically, yes. It would be hard to make a recording, but it’s been done and you don’t notice surface noise on the recordings. Any on-location recording in New York is dicey. Also editing at this place is very hard because it has about a five-second period of reverberation. It’s very clean reverb, but still, it’s a sound that’s very difficult to interrupt. BD: You notice the bumps where the splices are made? DS: Exactly. But that is a magnificent acoustic, and yes, it actually has been used for recording before. It works okay. BD: Do it at two in the morning, when there’s a little less traffic. DS: More or less, right. BD: You have an enormous amount of music to choose from — not just early music, but obviously you have a passion for new music, too. So how do you select what you will play on this or that program? DS: The next large solo program I’m going to do is on September 13th, and in this case I was asked back to Morgan Simmons Evening Organ Recital Series at Fourth Presbyterian Church. A couple of years ago I played a standard repertoire program of Bach, Messiaen, Alain, César Franck, and Maurice Duruflé. Morgan asked me back with the proviso that I play works of Chicago composers, and he has also composed a suite in three movements for me. Ralph Shapey’s Variations will be on the program and also Frank Ferko’s Symphonie Brève; Sowerby, of course. We’ll end the program with Fast and Sinister from his G Major Symphony, which is a wonderful piece. In Sowerby’s own words, he said, “Fast for the hearer, and sinister for the player.” [Both laugh] We will begin with the Dudley Buck E Flat Major Sonata. BD: I didn’t realize he was a Chicagoan! DS: Oh, absolutely. He was at St. James Cathedral for a while. We will also do his E Flat Major Sonata in Four Movements that ends with a fugue on Hail, Columbia. It’s really a good piece. There will also be a piece by Wilhelm Middelschulte, who used to be at Holy Name Cathedral, and Eric DeLamarter, who was one of Morgan Simmons’ predecessors at Fourth Presbyterian. BD: Anything by Richard Proulx? DS: No. What tended to exclude pieces was there just wasn’t enough room. This material worked out well as a program. BD: So, going back to my original question, how do you decide which ones to use? DS: In this case, the pieces were requested. In the case of a solo recital, generally speaking I put together pretty good programs, geared to a certain amount to the kind of audience I might expect to reach. For instance, last March I was asked to do a fortepiano recital at Mary Baldwin College. I thought the smartest thing would be to do Haydn, Mozart and Beethoven, so I chose a selection that I thought would provide a good psychological snap-shot of each composer in the way that the music was written and presented. Then I also included a piece of Mozart that I like very, very much, K553/494 in F major. It’s a very large sonata, almost a half hour long with all the repeats. I think it’s a wonderful piece and it doesn’t tend to be heard quite as much as some of the others. So that was really a matter of personal choice, a piece that I find interesting and I think audiences like very much, too. BD: This worked well on fortepiano? DS: Oh, of course. Needless to say, what Mozart doesn’t? BD: Do you think Mozart would be happy hearing his music on a Steinway? DS: I don’t know, though I will say that what the Steinway gives you in great dynamic range, unfortunately loses what the older instrument gives you with regard to changes of color, articulation and clarity. That is almost always to be considered. It’s not to say that you can’t do some very beautiful performances of this music on the modern piano, but there’s always something that you sacrifice, mainly because you have to do too much with dynamics. Because of its great resonance, the modern piano only gives you an illusion of articulation. BD: Since you work with the different instruments, would there be something to be said for changing instruments in the middle of a concert? DS: I think it’s misleading to do a Mozart sonata on fortepiano, and then switch to Schumann on a Steinway because the piano for which Schumann wrote is equally distinct from the modern Steinway as the piano for which Mozart wrote. To believe anything else is to take a Darwinian view of instrumental development. Composers wrote for the instruments they had at hand, exploiting what were sometimes both strengths and weaknesses. The organs of the early 19th century and back had purposefully unsteady wind, so you would have to know how to breathe. You could literally ride the wind of the instrument, and it gave you much more the idea that the organ was a wind instrument that’s controlled by a keyboard. BD: It was a living, breathing apparatus. DS: Absolutely! You bet. You not only can control the way that the palate opens with mechanical action, but in this case you really can control the way the wind enters, and that gives you a great deal of tactile power. This is just the same as a beautiful touch on a very well-voiced harpsichord allows you a good deal of sonic nuance vis-à-vis the way you brush the plector and pass the string. BD: When you’re playing a concert on one instrument, do you take into account all of these other factors to color your performance of each piece, and do you alter your approach for each piece to accentuate the virtues and defects that you may or may not have on that instrument? DS: To the best of one’s ability. If you were on a modern organ that has steady wind and equal temperament and electric action, the decisions you make in playing Bach and Lübeck certainly are brought to bear. Some characteristics, such as ornamentation or rhythmic treatment, would be doable. It’ll never happen quite in the same way. For instance, on an instrument with steady wind, when you play a large chord you can’t imitate the wonderful inbreathing of the instrument. Suddenly the instrument draws wind and the tone develops in a split second, and that’s inimitable. It gives it a very cushioned edge. It’s nothing like the attack of a wind band, but it fulfills the same purpose. If you think about it, organ music was certainly wind related. It was related to the harpsichord and the clavichord, but not predicated on them. But by the time you get into the 19th century, organ music tended to be less fashionable, and gradually became piano-dominated with the idea of continuous legato, and many chords attacked sharply and staccato. Finally it was necessary to affect a steadier winding system. For instance, if you play Marcel Dupré, it’s very, very hard to render a lot of his pieces on an instrument without steady wind because you can’t get all the very sharp, loud, almost orchestral attacks he wants. His style is pianistic, and therefore you have to be able to depend on some of the same characteristics. But certainly, on any given instrument you can make a certain amount of compensation. A good musician will do that. BD: I never thought about non-steady wind. Ever since we got rid of the little boy pumping the organ, I assumed that the wind would be on an even pressure. DS: Oh, not at all! In fact at this point, we now go to great lengths to have organs built so that wind can be raised by hand or by foot, and that also motors for such instruments are built painstakingly, with the idea that you’d be able to engineer the same effect with electricity in case you don’t have a calcant — you know, a bellows man. When I played at Wellesley, I had human winding. It’s not unsteady at all. It’s no more unsteady than the supplying of the wind by electricity, if the bellows person knows what he or she is doing. I had a very lithe German girl, and with one bellows being worked from above and the other from the feet, it made a constant, very slow-motion aerobic exercise on the part of the bellows person. Of course, you invited your bellows person out at the end to take a bow with you, because the soul of your performance really came from that person. If she decided to stop, that’s the end of the program. [Both laugh] It’s all by way of saying that the older music — from the very early part of the 19th century and before — is predicated on the idea that the wind wouldn’t be steady, so you would be able to do many more intimate things of control with the wind. When organ music became more dominated by piano technique, the idea of sharp attacks and continuous legato predicated a different kind of winding system. BD: How much of this technique is just overcoming the faults that the machinery had, and would the composers themselves have jumped at the chance of steady wind — like the use of valves on brass instruments? DS: It wouldn’t have done the same thing. That’s like asking if you would you like to hear computer-generated voices with no vibrato singing Beethoven’s Missa Solemnis. I’m not sure you would. It could be accurate, but it’s like saying a photograph is more accurate than a painting. Maybe so, but there are things you value in the painting that are different from a photograph. BD: A painting has soul. DS: Of course. A good photograph can do marvelous things, but that is a different art form. I believe very strongly that composers wrote for the instruments they had in mind, and builders carried certain traits with them, even through the 16th, 17th and 18th century, that make us think probably that they were very satisfied with what they were building. There was no need to change because the music wasn’t changing. When music changed, that didn’t mean the older instrument was necessarily lower in quality, but that it was just different. BD: So which came first, the chicken or the egg? Did the music change first, or did the instruments change first? DS: I think the esthetic changed in the case of the organ, because you certainly find that the organ is a more rarified instrument during the Classical period. It was on the throne, so to speak, during the Renaissance and Baroque. By the time you get to the Classical period, the organ polyphony and other styles of playing that were common parlance through Northern Europe go out of fashion. Certainly Johann Sebastian Bach’s works continued to be played in churches throughout the 18th century in Germany because there are so many works for which we don’t have an autograph; there are just lots and lots of copies. Basically the organ started to fade out during the Classical period. By the early Romantic period, the piano was the instrument of choice. The organ existed in churches, but the way of teaching and the position in which the organ was held artistically gradually meant that organ playing would be dominated by aesthetics that came out of a different kind of music. BD: What is the position of the organ in today’s society? DS: Usually off in a transept, or in the west end! [Lots of laughter] Oh, sorry. Couldn’t resist! Really, though, it’s hard to say. In some countries the organ is still quite revered. In Germany, Holland and other places on the continent, and in certain churches in France it’s pretty much as revered as it ever was. I think the playing is at as high a standard as I’ve ever heard now. BD: Do you feel that the influx of the new kind of keyboards with the computer-generated sounds are posing any kind of special threat to the organ? DS: Not really. In its liturgical capacity, the organ reached the biggest audience you could imagine in older times, because the biggest crowds you could usually muster would go into churches and cathedrals. With mass media and the shift away from being a predominantly religious society, there has to be some change in the way that the organ is held in esteem or knowledge. A lot also depends on whether the local orchestra will have a concert hall with an organ and a tradition of using it. 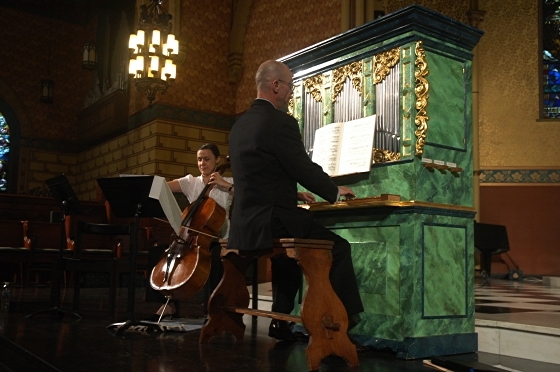 The instrument is so massive, so hard to move, that not only the position of the organ artistically, but its physical position, has a lot to do with the regard in which it is or is not held. If you’re not near one of these big instruments, you can’t know what they’re like. On the other hand, some people grow up with, or somehow become associated with a series or a church that has an instrument that causes them to develop an appreciation. So it’s hard to say. I think you find it in pockets. BD: Because a certain group of people is going to hear the same instrument every time, do you have to bring whatever it is you can bring when you’re part of that series in another location, in contrast to different violinists coming with different instruments? DS: Sure. It’s a good point. I think each organist is going to make the instrument sound differently. In some cases you could say the better the instrument is, the more different each person is going to be able to make it sound — both for better and for worse. On the other hand, it’s a lot of the organist’s life to get in and play not very good instruments, and it’s your duty to try to make them sound the very best you can. It’s certainly possible. Once in a while, you really kind of have to create something out of nothing! BD: Do you feel it’s your responsibility to exploit every possibility of each instrument you come to? DS: As much as you can, certainly. 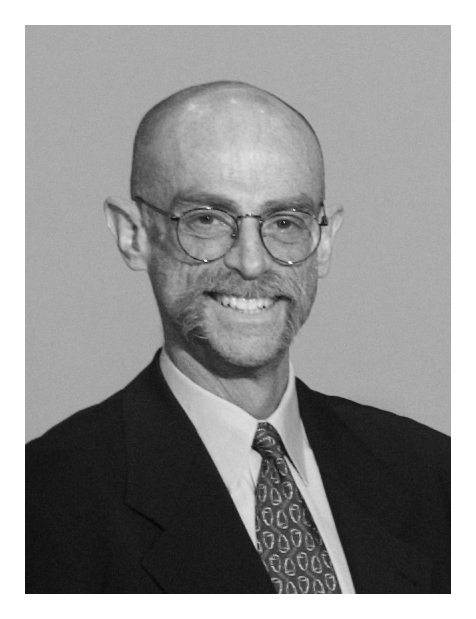 The last time that David Craighead, now the retired head of the Organ Department at Eastman School, came to Fourth Presbyterian in Chicago, he would spend hours just trying out combinations of stops to see which things worked the best. BD: That’s not something you can do from seeing a list on paper. DS: No, absolutely not. Every instrument is different. Of all instruments, the organ — and individually, a few very fine old string instruments — are the least standardized instruments there are. Everything is different. In fact, you could literally copy the same organ, and the minute you put it in a different room it’s a different instrument. Different things will work together that would have been more or less successful in the other space. BD: Then is it a waste of time for them to send you a list of stops ahead of time? DS: No, that kind of helps. At least you know that there’s cake flour in the kitchen, but I wonder if it’s going to be the really high gluten kind that makes rubber cakes. It’s the same thing. You will know there’s a krumhorn on the positive and that’s very good, but if it sounds like Alice the Goon, I probably can’t use it for this piece. [Both laugh] The stop will have so many different sounds than what the name on paper would indicate; that just gives you a little help. You know what ballpark you are working in. BD: Once you sit down at the instrument, how long does it take before you know it and understand it? DS: It depends. A smaller instrument, in most cases, you’ll get to know sooner. If it’s a small instrument of extremely exquisite or cleverly built quality, you could spend forever. A particular instrument in Salamanca comes to mind. It was made around 1600 and added to around 1687. What that instrument will do is astonishing, and it’s only got about fifteen stops. BD: Does it have two manuals? DS: No, one manual but the stops are divided, as in the traditional Iberian organ in most cases — middle C# to the top of the keyboard is one half of the chest, the other chest goes down to the bottom so that it’s possible to play with two different colors in the hands simultaneously. In fact, every time you see a piece that bears the name medio registro, it means that it’s for divided register or half-register. You can put the solo color in your left hand or you could put it in your right hand, and there are pieces that exploit both of those. But those organs are incredibly versatile. By the same token, you sometimes get to a large instrument that is either very well made, or only a certain amount really counts. For instance, when you’re trying to play loudly on a very large instrument, the trick to doing it really well is to use as few stops as possible. You only want to use what counts. BD: So you don’t just “pull out all the stops”? DS: No, by no means. [Laughter] That expression is a bad one on most organs because you don’t want to do it. You can’t make yourself clear, and even if you gain one decibel in sound, which is not a big deal, you lose so much in your articulateness at the instrument. Since the soul of the organ is timing and rhythm, if you lose that, you put your audience to sleep. The organ recitals that put me to sleep are ones that don’t have any rhythm. The instrument doesn’t inherently have a rhythm of its own, and all of that must be supplied by timing on the part of the performer. DS: That’s part of it. All interpretation on the organ happens in a rhythmic context or an articulated context, both of which have to do with time. So I guess you not only wiggle the air, but you wiggle chronology, too, in playing the organ. BD: We have been talking about organ, fortepiano and harpsichord. How do you divide your time among these instruments? Are you primarily an organist, primarily a harpsichordist, primarily a pianist? DS: This is sometimes confusing. I would like to be able to answer the question better myself from time to time! Suffice it to say, right now I’m an organist and modern pianist because of some projects coming up. Then shortly after that I’ll turn into a harpsichordist/fortepianist again for a while. Then I’m due to turn into a pianist again, a modern pianist, and it sort of goes like that. BD: So you’re really a keyboardist? DS: I guess so. I remember the organ builder John Boody once called me a musical omnivore, and I guess that maybe is the most accurate description. BD: [Laughs] Is that good or bad? DS: It’s good in the respect that you have a very diversified experience of different styles and different aesthetics, and if you can absorb those well, they do nothing but enrich your musical language. On the minus side, you’ll never be able to learn one large corpus of repertoire on one instrument that some other people could do. BD: Generally it seems that performers are either mostly organists who dabble in harpsichord, or mostly harpsichordists who dabble on the organ a little bit, or mostly fortepianists who occasionally use a Steinway. DS: There are exceptions. Gustav Leonhardt’s a good example of someone who’s a magnificent organist and harpsichordist. In his case, what he’s done is steeped himself in the 17th and 18th centuries. He really lives in the era, but he plays both instruments interchangeably. After the last organ recording of his I heard, I take back everything I ever might have said about his maybe being a little uncomfortable with the organ, because that sounded magnificent. With the harpsichord, I always though he was Jovian; a wonderful figure! On the other hand, you still can learn a pretty large corpus of repertoire on each instrument, and read a lot. For instance, as an organist I find that my rhythm and sense of nuance is complemented by the fact that I play chamber music. 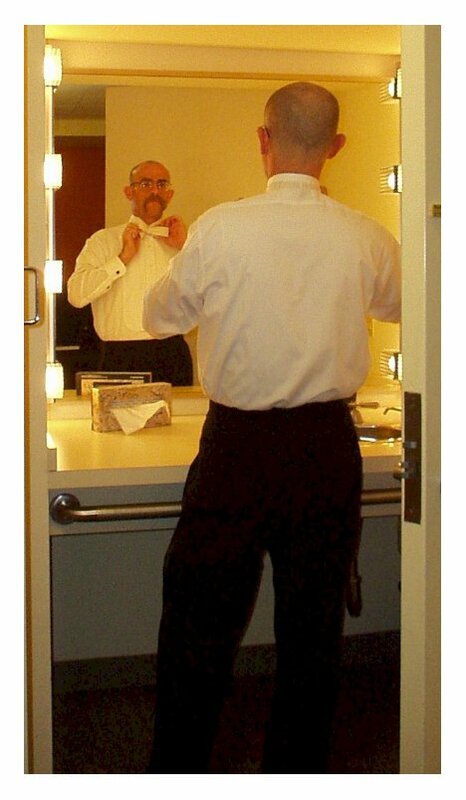 A lot of organists don’t get to do that, so I feel fortunate in the perspective it gives me. It improves your rhythm and also your reaction to things that happen within other people. Therefore your listening is honed more carefully. BD: In chamber music, you have to listen more than feel. When you’re playing alone you can feel and listen. BD: Is there new music being written for harpsichord that is of value? DS: I think so, though I’m never certain about the harpsichord’s viability in 20th century music. I know this will raise a great hue and cry. I’ve certainly played my share of it, in fact I have a CD of chamber music of Elliott Carter, Hurnick, Argento, and the de Falla Concerto. It’s with Rembrandt Camber Players, and Patrice Michaels Bedi singing in the Argento songs. [See my Interview with Elliott Carter.] I think composers have used it very creatively, but I question the wisdom of subjecting the instrument to equal temperament because automatically that makes it lose its focus. A composer once said to me that in her opinion the harpsichord tended to lose pitch as you came down from the stage, and I tend to agree. Equal temperament, and an overly loud body of collaborative instruments, i.e. modern instruments, tend to make it a different animal than it really is. Very cleverly the Poulenc Concert Champêtre is written so the harpsichord plays against the orchestra most of the time. The orchestra stops and the harpsichord does something. Only occasionally do you have to do one of these passages where you really feel you could be playing anything you want and no one would notice! On the other hand, the music itself, in the hands of a good composer, is of excellent value. BD: Hence my earlier remark that we should go to Ben Johnston or Lou Harrison who work in micro tone and mean-tone to write something for the harpsichord. DS: Mayhap. I’d be curious to see how it worked. I know a certain corpus of new music for the harpsichord, but I can’t say I know what might be considered to be on the cutting edge. 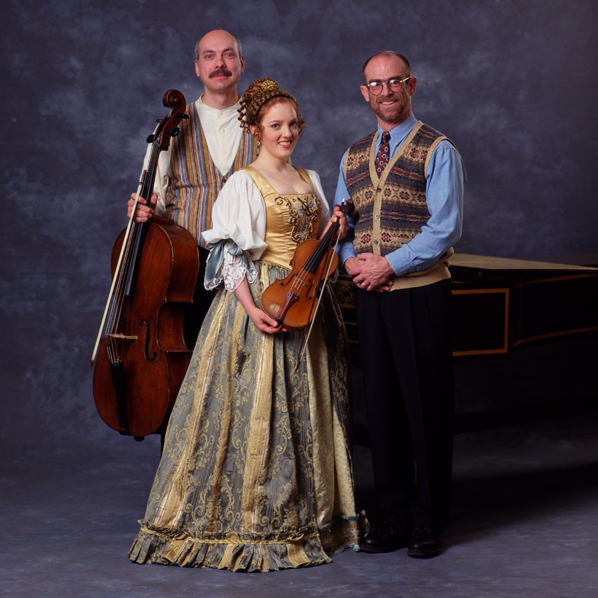 The Southeastern Historical Keyboard Society sponsors what’s called the Aliénor Competition, which is for new harpsichord works. That’s been going on for several years, and it promotes the cause of new music composed for the instrument; a variety of approaches and also the incentive for people to play the works. BD: What advice do you have for a composer who wants to write something for the harpsichord? DS: On the pure technical level, confine yourself to a range of contra-F to F-3. Count on two eight-foot choirs of strings and one of four-foot, maybe a buff stop and the use of hand stops. Then grab your score paper and go! BD: Beyond that, it’s open to the imagination? DS: As much as you can reach with your hands. I did have a composer write me a nose-note once. [Both laugh] The only way I could get the note was with my nose, and she said it was okay if I played it that way. It was a low sonority, and unfortunately I had both hands otherwise occupied up higher on the keyboard. She still wanted this note, so I said, “Is it okay if I play it with my nose?” I had enough time to get to it, so it was fine. There was a certain comic effect on the audience. I remember once playing an organ recital where I had to take a stop off with my foot. Unfortunately it was the end of a very, very beautiful exotic-sounding kind of piece. The ending should be magic, and I brought my left foot up, turned the stop off and there was instant hilarity in the audience. We sort of lost the mood there. BD: Couldn’t that have been taken care of with a foot pre-set? BD: Where should the audience look? Should they look ahead at the front of the church, or should they look back at the organ, or should they look up or down, or what? DS: Do whatever you want! In a church that had chairs, I knew a priest who would always have the folks turn their chairs around so they could look up and back at the west end, which was where the organ was. BD: But you can’t turn pews around. DS: That’s true, but you can turn your neck if you want, or look at the stained glass windows if it’s an afternoon recital, or read your program if they’ve left the lights high enough. BD: When you’re playing harpsichord in the middle of the Chicago Symphony Orchestra, is that a completely different feeling for you? DS: Certainly. There’s a radical difference between playing the harpsichord in a period instrument ensemble and being in a work like Haydn’s Creation or Seasons, or to play the organ part for Holst’s Planets. You realize that there’s no way, even with every blasted thing that counts on the instrument, that you’re going to come anywhere near the volume of the augmented wind and brass section with all the extras. BD: So then what’s the point of your being there? DS: Well, you can still hear something. I think composers use the idea that sometimes that third flute part is still going to get heard, in spite of the fact that all the trombones, tubas, and trumpets are going like mad! But the flute’s got to have something to do, so it looks like the flutes aren’t just sitting the loud part out. BD: Let them be part of the action. BD: That’s right. Drown ‘em out! DS: Absolutely. Sometimes the singer is just there for effect. [More laughter] Though it’s interesting, in the Liebestod, Wagner never marks anything more than forte. Even then, you have a feeling that Isolde is being overwhelmed in the last scene by her transformation, and it’s depicted so beautifully in the music. BD: Do you play differently in concert than you do in the recording studio? DS: Sometimes, yes, I think you’re shooting for something different. You’re certainly shooting for a personal interpretation, but in some ways what you do in a recording studio, while spontaneous to an extent, is more calculated. You want to make sure that you play cleanly, in a way that you know is going to last innumerable playings — as the old vinyl records used to say they would. In a live performance, you might want to do something eccentric that you think will rub off well on your audience, but not in a recording studio. BD: Is it pre-ordained eccentricity, or an experiment that you don’t know whether it will work or not? BD: You can’t do that in the recording studio? DS: You can if you want, but sometimes the results will be less than you imagine. You need the electricity of the audience to make you do things like that in a way that’s really meaningful. In the recording studio you certainly interpret. I would dislike hearing a mechanically done, or just perfunctory performance of a work in any situation. But because you’re committing an interpretation to the recording that’s going to be heard many, many times, some effects should be taken into consideration. They might work better once or twice, but maybe should be deleted from a recording where they’re going to be heard fifty or a hundred times by their owners. BD: Can a recording get to be too perfect? DS: I doubt it, though people will sometimes accuse recordings that have everything in place as being sterile. I don’t know; it’s hard to say. Years ago, Andrew Porter came to Chicago when Abado conducted Wozzeck, and his only criticism of the performance was that he thought it was too clean. [See my Interview with Andrew Porter.] To me, I thought it was the most astonishingly beautiful Wozzek I could imagine. BD: He got everything right? DS: Oh, yeah. Everybody got everything right! So it’s hard to say. BD: So if everybody is getting everything right, does that miss the mark? DS: No, not at all; certainly not if it’s done with conviction! That’s the desideratum; you really do want to get it right. Missing notes for effect is just base irresponsibility — unless you’ve really banked on getting an effect, and then I suppose you have a right to go for it. But if you can get it right and have it have intensity and excitement and immediacy, that’s the desideratum in anything; it doesn’t really matter who the composer is. BD: Is playing keyboards fun? DS: Sure. As with any profession, there are times you think you’re doing work, but the practicing I’m doing right now for some projects in the fall and for the Chicago Composer’s Recital has been difficult but very pleasurable. It’s almost a whole new program for me, and in that respect I’ve become acquainted with a lot of new and old music. I have gotten myself to practice in a very regular and disciplined way, which is sometimes hard for professional musicians. You’re no longer in the conservatory, where you have your designated time of day when you duck into the practice room and are never heard from again. [Both smile and nod in nostalgic recognition of times past] Out in the professional world schedules are irregular, so this summer has afforded me a little more time to do some very regular, intense practice. This program has forced me to do it. So I am saying that yes, I’m having fun. BD: Are you also doing some teaching? DS: Yes. I teach at Chicago Musical College, at Roosevelt University. I teach history courses, and I also teach private organ and harpsichord lessons. This fall I’ll teach History of Music in the Classical Period. BD: Will you use Rosen’s book The Classical Style? DS: I have, but I’m going to try something new this year. It’s a new collection of essays on different sociopolitical environments in the classical period that is edited by Neal Zaslaw called The Classical Era: From the 1740’s to the end of the Eighteenth Century. But I like Rosen’s book. I find, though, that given the linguistic diversity in my history classes at Roosevelt, it’s very hard to always assume you’re talking about things in common when you read that book. The other thing is I find myself at odds very often with Rosen’s views on performance practice, or sometimes just judgments on the value of certain works. I think it’s too confusing now, given the limited amount of time for lectures, to spend part of my time arguing with Rosen, and then part of my time saying what I think is good — and much is. Obviously, he is a gifted, articulate, sensitive musician. BD: But very controversial in a lot of things he says? DS: I think so. For instance, he writes off the E-Flat Double Piano Concerto of Mozart as a snuff box ornament. Those aren’t his actual words, but I think there’s much more to that piece than something that’s merely workman-like. That’s my opinion, but I thought it would be interesting to take a different historical tack because most of what we really spend our time doing is analyzing individual works. This will provide a historical background and allow the analysis to be a little more participatory. BD: Do you find that if you analyze a work in real depth, that the students can then extrapolate that to other works of the same composer, or other composers of the same era? DS: You hope so. It’s something that takes a while; it certainly did with me. There’s still things that I was told in school that have come alive to me only recently, or maybe some have yet to do that. A good teacher goes on teaching for years and years after the students left the classroom or the studio. I find that there are still things from which I profit that I might not have understood fully at the time. BD: I like that idea of teachers being there for the student long after the class is finished. DS: It can be confusing sometimes, though, in the process because there’s lots of information to sort out. I think you owe a student enough clarity so that you can answer the questions in class to give him a general idea of where he’s going. Of course, a student with initiative will always pick this stuff up. BD: What advice do you have for audiences that come to hear one of your recitals? DS: I can’t really say I have any in particular, except really come to enjoy. Depending on the nature of the program, come with armor on or not. BD: Armor??? To fend off what? DS: Who knows? It depends on the case. Often with audiences, it’s the amount of new music you’re playing, or maybe the amount of old music you’re playing, or this, that and the other thing. But I have no other advice for prospective audience members than what I’d give myself if I were going to a concert — just be prepared to enjoy, and have an open mind. DS: In some cases, what’s old is what’s new. You can always reintroduce that, so that’s maybe one criteria. You can expect something new if you are unfamiliar with aspects of performance practice. Or if you have played a piece for a long time, you can expect something new in terms of the way it’s grown. But all of that is of such a general nature that I wouldn’t really call it advice! I think that’s probably something that kicks in automatically. BD: Is there a balance between art and entertainment in music and musical performance? DS: That’s difficult to say because my own involvement with music is intense enough that certainly it can be very entertaining. But there will also be a certain level of involvement that doesn’t allow me to speak for somebody else. BD: Thank you for coming in. I appreciate it very, very much. DS: Oh, my pleasure. I’ve enjoyed it very much. David Schrader has appeared at numerous music festivals throughout the USA and Europe. At the prestigious Irving Gilmore Keyboard Festival, he was the featured performer performing five separate concerts, performing on organ, harpsichord and clavichord. He performed as the Artist of the Year at the Oulunsalo Soi Music Festival in Oulu, Finland. 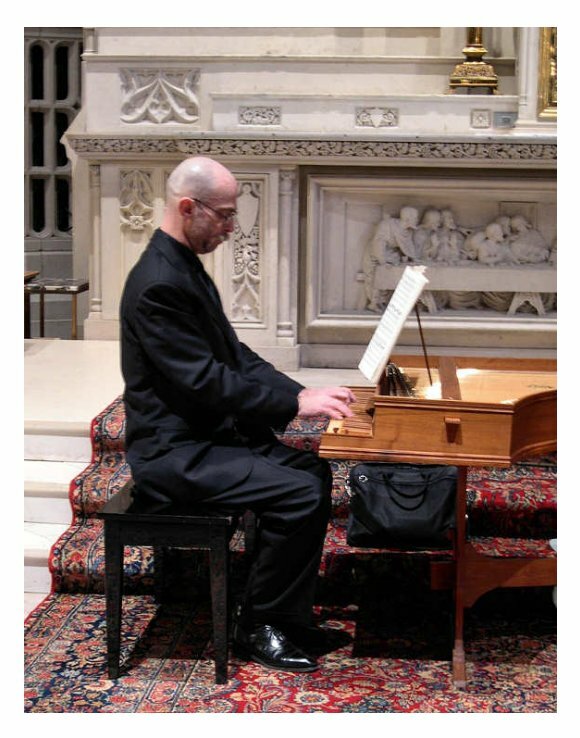 In 2000 he was the harpsichord soloist with the Nagaokakyo Chamber Ensemble in a tour of Japan under Yuko Mori and the Canadian Baroque orchestra Tafelmusik in a European tour, He has also performed at the Aspen Music Festival, the Michigan Mozartfest with Roger Norrington, the Connecticut Early Music Festival, the Manitou Music Festival, and the Woodstock Mozart Festival where he performed as soloist and conductor. David Schrader's newest recording with Grant Park Symphony of music for organ and orchestra by American composers is the first recording of the Casavant Frères organ in Chicago's Symphony Center which was described by John von Rhein of the Chicago Tribune as a "rich palette of sounds and deft rhythmic interplay ...Schrader's 17th recording for the Chicago-based indie label may be his best yet. Go for it." His other recordings include concerti of J.S. Bach with the Stuttgarter Kammerorchester, and continuo with the Chicago Symphony Orchestra for both recordings of Sir Georg Solti's Creation, and the St. Matthew Passion (BWV 244) and Messiah. He has many releases of solo repertoire on the Cedille label, including the music of J.S. Bach, Soler, Franck, Antonio Vivaldi, Dupre and Domenico Scarlatti. His recording of Soler’s "Fandango & Sonatas" was described thus "We have never heard more beautiful, natural, realistic harpsichord sound .. The playing? Excellent ... There is no better recording on CD" (American Record Guide). "The popular ‘Fandango’ has perhaps never received so exhilarating a reading" (Chicago Tribune). "His recording of J.S. Bach "Fantasies & Fugues" "captures the sense of improvisatory, virtuosic energy that is to be found so plentifully in this music." (Continuo) He has also recorded for the Centaur and CRI labels. This interview was recorded at the studios of WNIB, Chicago, on August 9, 1992. Portions (along with recordings) were used on WNIB a few weeks later, and again in 1997. This transcription was made and posted on this website in 2012.